Come this january, I've been playing baduk (also known by the less unique name go in the western world) somewhat actively for a year. I had been playing a little before that, but not nearly as much. It is odd that I did not start playing earlier, but things are what they are, and a year ago the stars aligned. So what have I discovered this past year? Calling it a discovery may be cheating, because I kind of knew it from before. But baduk is really beautiful. For being a turn-based game, it has a sense of fluidity only rivalled by real-time games. When my opponents defenses are weak somewhere, I come pouring in like a river breaking a dam. During border clashes on the board, both sides are building up toward the middle like water filling in a sink. I think this ties in with the length of the game. A common time setting is to allow both players 30 minutes each of time in total for the game. Given that a game lasts 200–300 moves, each player has a whole 100–150 moves to make within their 30 minutes. This works out to making a move every 15 seconds, on average. Since moves are always being made, the game still gives a sense of real-timeness even though it's turn based in actuality. Moreover, the shapes being created on the board by both players. Oh, the shapes! So beautiful. With names like "the ladder", "the tiger's mouth", "the trumpet connection" and "the carpenter's square" they trigger in me the same aesthetic awe as watching constellations in the night sky. Along with the shapes are a sense that I am part of something bigger. I didn't invent these shapes – they were invented by people hundreds of years before me. I don't know how to make use of these shapes – that will be figured out by people hundreds of years after me. 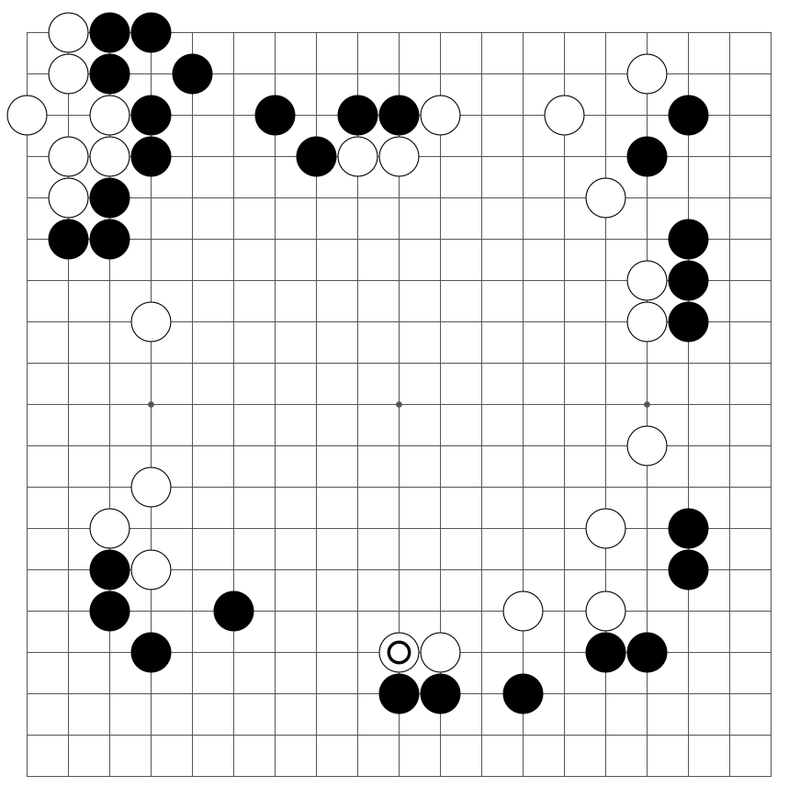 Baduk has a humbling timeless quality to it. With the shapes, every board shows a visual history of the struggles of the players during the game – what they thought was important, where they surrendered, where they argued, where they traded and where they killed. In this game, which is a year old now, I was facing an equal opponent on even terms. In the snapshot, the game is still in the early middle-game; fighting has started, but there is still a lot of unclaimed space on the board. The marked move serves to contain the single black piece it almost completes a surround around. It was played to limit the strong black presence in the upper area of the board. In the end, it worked to my favour – I managed to take almost complete control over the upper area of the board, despite black's strong advantage there from the early game. 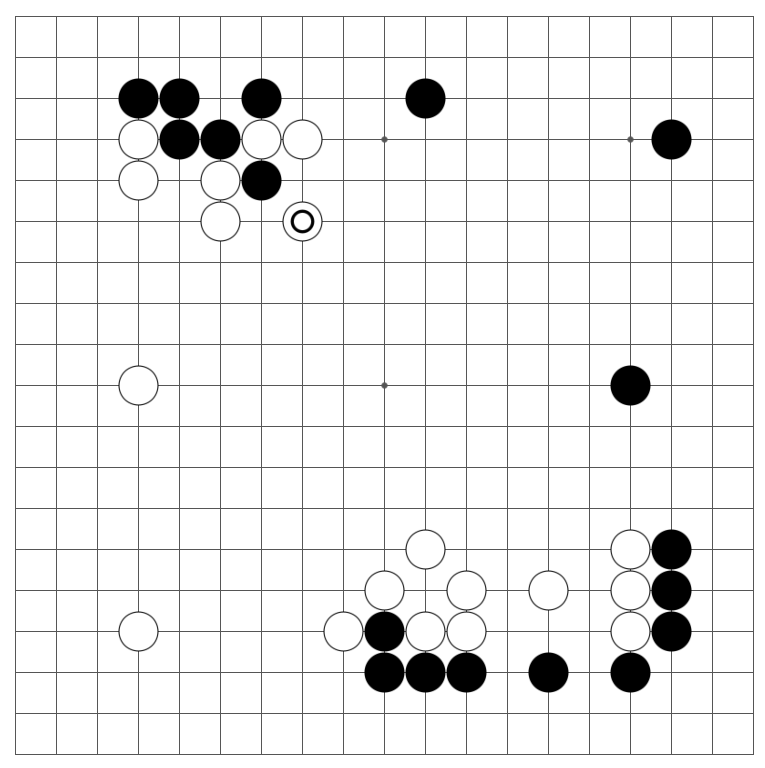 One of the most common mistakes by beginners learning to play baduk is their relentlessness: a beginner will try to capture everything, surround everything, take control of everything, kill everything. When attempting to attack all over the board, they will stretch their lines very thin. Instead of having a few powerful settlements, they will have individual hunters thrown in the wilderness, without weapons and without food. Some might survive, but most will succumb. Imagine trying to wage a war solely by parachuting individual soldiers randomly over your enemy! Once you realise the folly in that, you learn that baduk is a game of giving and taking. It's about cooperation; someone said that "the key to baduk is giving your opponent exactly what they want, but making them want the wrong thing." If your opponent wants to kill one of your groups worth 15 points, let them. Force them to do it as you take control over territory worth 20 points behind their back. Being able to yield and, for lack of a better wording, "go with the flow" is a virtue in baduk as well as in life. I frequently come across situations where chaos seems certain, unless I accept whatever is thrown at me and make the best of it, coming out on top in the end because of it. Sometimes, your ego is your worst enemy. Learning to defeat it on the baduk board helps with learning to defeat it in life. One of the most popular books on fundamental baduk strategy and tactics is, appropriately enough, called Lessons in the Fundamentals of Go . The author stresses the fundamentals throughout the book, and for good reason. This is true for many other skills, which I hadn't realised until I started playing baduk. I've started paying much more attention to the fundamentals, and suddenly learning more advanced concepts is easier, because I'm building on solid fundamentals. If you don't focus on your fundamentals, you are only wasting your own time. This is one of my most recent games. I'm facing a weaker opponent, who is getting four stones of handicap, which is the baduk way of saying that I skipped my turn four times before starting to play. This is a common way of leveling the playing field in baduk, and it works really well. I discovered early on in the game that my opponent, who had black, focused a lot on territory. Therefore, I made it my game plan to trick my opponent into securing more and more territory along the sides of the board, while letting me build up an even bigger positional advantage in the middle of the board. This strategy won me the game 120 moves later, when my opponent realised how much he had given up in his scramble for territory and resigned with a polite, "Thank-you for the game." If you do not know the game, but want to learn it: check out The Interactive Way to Go . You can learn all of the rules in literally ten minutes and have a blast playing, but it will take more than a lifetime to figure out all the strategical nuances of the game. If you know the game and got inspired to play, I recommend registering at the Online Go Server (super quick process – just type in your desired username and password and you're done) and looking for a game on there. There are plenty of beginners as well as experinced players, all excited to play with you.